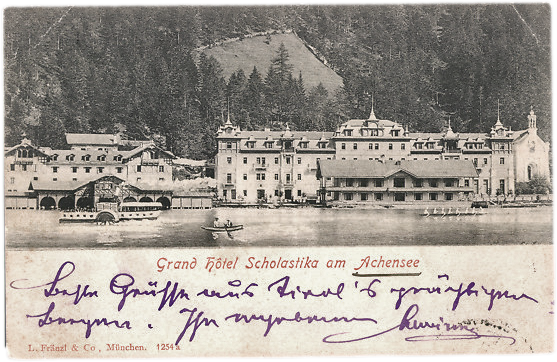 In 1904…I was staying at the Hotel Scholastika, on the borders of the Aachensee, in Austria. I dreamed one night that I was walking down a sort of pathway between two fields, separated from these last by high iron railings, eight or nine feet high, on each side of the path. My attention was suddenly attracted to a horse in the field on my left. It had apparently gone mad, and was tearing about, kicking and plunging in a most frenzied fashion. I cast a hasty glance backwards and forwards along the railings to see if there were any opening by which the animal could get out. Satisfied that there was none, I continued on my way. A few moments later I heard hoofs thundering behind me. Glancing back I saw, to my dismay, that the brute had somehow got out after all, and was coming full tilt after me down the pathway. It was a full-fledged night-mare; and I ran like a hare. Ahead of me the path ended at the foot of a flight of wooden steps rising upward. I was striving frantically to reach these when I awoke. Next day I went fishing with my brother down the little river which runs out of the Aachensee. It was wet-fly work, and I was industriously flogging the water when my brother called out: “Look at that horse!” Glancing across the river, I saw the scene of my dream. But, though right in essentials, it was absolutely unlike in minor details. The two fields with the fenced-off pathway running between them were there. The horse was there, behaving just as it had done in the dream. The wooden steps at the end of the pathway were there (they led up to a bridge crossing the river). But the fences were wooden and small, —not more than four or five feet high, —and the fields were ordinary small fields, whereas those in the dream had been park-like expanses. Moreover, the horse was a small beast, and not the rampaging great monster of the dream —though its behaviour was equally alarming. Finally, it was in the wrong field, the field which would have been on my right, had I been walking, as in the dream, down the path towards the bridge. I began to tell my brother about the dream, but broke off because the beast was behaving so very oddly that I wanted to make sure that it could not escape. As in the dream, I ran my eye critically along the railings. As in the dream, I could see no gap, or even gate, in them anywhere. Satisfied, I said, “At any rate, this horse cannot get out,” and re-commenced fishing. But my brother interrupted me by calling, ” Look out!” Glancing up again, I saw that there was no dodging fate. The beast had, inexplicably, just as in the dream, got out (probably it had jumped the fence), and, just as in the dream, it was thundering down the path towards the wooden steps. It swerved past these and plunged into the river, coming straight towards us. We both picked up stones, ran thirty yards or so back from the bank, and faced about. The end was tame, for, on emerging from the water on our side, the animal merely looked at us, snorted, and galloped off down a road. An Experiment with Time divides into two main topics. The first half of the book describes a number of precognitive dreams, most of which Dunne himself had experienced. His key conclusion was that such precognitive visions foresee future personal experiences by the dreamer and not more general events. The second half develops a theory to try and explain them. Dunne’s starting point is the observation that the moment of “now” is not described by science. Contemporary science described physical time as a fourth dimension and Dunne’s argument led to an endless sequence of higher dimensions of time to measure our passage through the dimension below. Accompanying each level was a higher level of consciousness. At the end of the chain was a supreme ultimate observer. According to Dunne, our wakeful attention prevents us from seeing beyond the present moment, whilst when dreaming that attention fades and we gain the ability to recall more of our timeline. This allows fragments of our future to appear in pre-cognitive dreams, mixed in with fragments or memories of our past. Other consequences include the phenomenon known as deja vu and the existence of life after death. This entry was posted in Uncategorized and tagged 20th Century, Animals, Austria, Books, Dreams, Great Britain, Horses, J. W. Dunne, Oddities, Psychology, Time. Bookmark the permalink.